Also known as “Phurphura” is a village located in West Bengal known as Furfura Darbar Sharif. 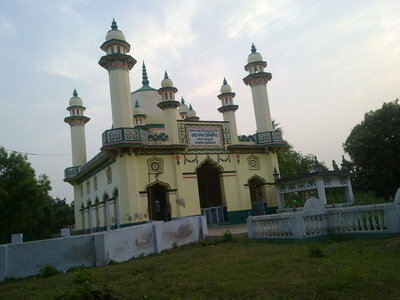 This popular pious Muslim village is situated in the Hooghly district in the Srirampore subdivision. This sacred village comprises of a mosque that has been constructed by Muqlish Khan in 1375. In addition, this mosque attracts a large number of devotees especially during the Urs festival. Furthermore, this village is renowned for a tomb belonging to Hazrat Abu Bakr Siddique and his five sons also known as the “Panch Huzur Keblah”. The best time to visit this pilgrimage site is from October to February during the winter when the climate is extremely pleasant with the temperature ranging from a maximum of 23 degree Celsius to a minimum of 12 degree Celsius. The nearest station to this pilgrimage site is located in Sealdah. The Sealdah Railway Station is well connected to major towns and cities in the state. If you intend to drive to this pilgrimage site then the ideal starting points would be Bhubaneswar, Cuttack, Puri, Patna, and Kolkata. There is one route from Bhubaneswar to this pilgrimage site, and it is via NH16. There is one route from Cuttack to this pilgrimage site, and it is via NH16. There is one route from Puri to this pilgrimage site, and it is via NH16. There is one route from Patna to this pilgrimage site, and it is via NH19. There are two routes from Kolkata to this pilgrimage site, and they are via NH19 and via Bankura-Belator-Sonamukhi-Khandaghosh-Nischintapur Road/Kolkata-Mumbai Highway and NH19. The nearest airport to this pilgrimage site is located in Kolkata. The Netaji Subhash Chandra Bose International Airport is well connected to major cities in the country as well as to international destinations. There is no major religious myth or folklore attached to this pilgrimage site apart from the presence of two tombs of Hazrat Shah Kabir Halibi and Hazrat Karamuddin who were killed during the battle against the Bagdi king who ruled the area. In addition, this pious site also comprises of the tomb of a renowned religious reformer Abu Bakr Siddique and his five sons. Furthermore, this tomb is popularly referred to as “Panch Huzur Keblah”.